At 2:47am on August 3, 1923, Vice President Calvin Coolidge became the 30th president of the United States when he took the oath of office in the sitting room of this modest frame and clapboard farmhouse. President Harding had died only a few hours earlier. Coolidge’s father, a notary public, administered the oath by the light of a kerosene lamp; he refused to install such modern conveniences as electricity. Located in the tiny community of Plymouth Notch in the beautiful hill country of Vermont, the house where he took the oath of office was also Calvin Coolidge’s boyhood home. Although he spent most of his adult life in Northampton, Massachusetts, Coolidge often returned to the old homestead to visit his family. He never lost his fondness for Vermont and its people. Famous for his honesty, thrift, and taciturnity, “Silent Cal” restored confidence in government after the Harding scandals and symbolized stability during a period of rapid, disorienting social change. 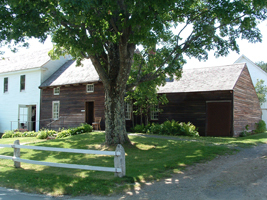 The Calvin Coolidge Homestead District at Plymouth Notch preserves many of the historic buildings that Coolidge knew in his youth: his birthplace, his boyhood home, the church that he attended, the homes of relatives and family friends, and the hall above his father’s old store, which he used as his office during the summer of 1924 and others. Coolidge and his wife lie amid seven generations of Coolidges in the town cemetery. In 1872, John Calvin Coolidge (his family called him Calvin or “Cal”) was born in a house attached to his father's general store. In 1876, his father, "Colonel" John Coolidge, purchased the homestead across the street, a simple, one and one-half story farmhouse connected to a barn in the typical New England “big house, little house, backhouse, barn” configuration. He repaired the house, bought some new furniture, and added a front porch and two-story bay windows, but made few other changes. Today, a formal parlor, the most elaborate room in the house, used only on special occasions, contains the black walnut, horsehair-covered furniture Colonel Coolidge purchased in 1876, as well as the original rug, lace curtains, and cast-iron stove. The sitting room, known as the "Oath of Office Room," displays the table, Bible, and kerosene lamp used in the inauguration. President and Mrs. Coolidge occupied a second floor bedroom during their many visits. Because the upper floor is not open to the public, the State of Vermont moved their furniture down to one of the first floor rooms. The kitchen, which opens off the front porch, contains the original cast-iron wood stove and a table set for four. Calvin lived at the homestead until 1887, when he went away to school. In 1895, he graduated with honors from Amherst College in Massachusetts. He then moved to nearby Northampton to study law. Northampton would be his home for the rest of his life. After admittance to the bar in 1897, he established his law practice and soon became involved in local politics. Coolidge began a steady rise in the State Republican Party in 1899. He started as city councilman in Northampton and ended as mayor. He later served in both houses of the Massachusetts State Legislature. From 1916 to 1919, he held the positions of lieutenant governor and governor of Massachusetts. Coolidge gained national attention during the Boston police strike of 1919. When the strike resulted in a day and two nights of rioting, Governor Coolidge ordered the National Guard to Boston to restore order. In a famous letter, he told Samuel Gompers, head of the American Federation of Labor, that there was “no right to strike against public safety by anybody, anywhere, anytime.” His firm position made him popular with many people, and the Republican National Convention selected him as running mate for Warren G. Harding in 1920. The Harding-Coolidge ticket won the election by a comfortable majority. Coolidge’s actions as president and his reputation for personal honesty went a long way toward restoring public confidence in the government and the Republican Party. He encouraged prosecution of those involved in the scandals of the Harding administration. He stood for traditional moral principles at a time when those values seemed under attack. Running for reelection in his own right in 1924, he promised a continuation of "Coolidge prosperity." He captured more than 54 percent of the popular vote defeating Democrat John W. Davis and Progressive Robert M. La Follette. President Coolidge was a traditional conservative Republican in his domestic policy, committed to maintaining the status quo. He proposed little new legislation to Congress and opposed Federal programs that he saw as threats to individual freedom and initiative. He vetoed a proposed Federal power project on the Tennessee River; reduced the number of antitrust suits; blocked plans to subsidize farmers, who had been in a deep agricultural depression since 1920; and advocated tax cuts, governmental economy, and high protective tariffs. In 1924, he signed an immigration bill that set strict quotas favoring immigrants from Northern Europe. In foreign affairs, his administration’s most important achievement was the Kellogg-Briand Pact of 1928, a multinational agreement to outlaw war, largely negotiated by Frank Kellogg, his secretary of state. Otherwise, Coolidge opposed international agreements. Summer White House office above the store. Coolidge was extremely shy as a child and a reluctant conversationalist as an adult. His popular wife, Grace, whom he married in 1905, was an asset to him. The sudden death of his younger son from an infected blister on his heel in 1924 brought him much sympathy. Coolidge was the last president to hold White House receptions open to the general public. Oddly enough, he did not seem to mind posing for photographs with a variety of visiting groups, delivering speeches, and receiving scores of delegations. Despite his popularity, Coolidge chose not to run for reelection in 1928. He retired to Northampton the next year—before Wall Street’s “Black Thursday” ushered in the Great Depression. In retirement, he published his autobiography and wrote newspaper articles. In 1933, he died suddenly in Northampton at the age of 60. Calvin Coolidge willed the homestead to his surviving son, John. In 1956, John donated the house and all its furnishings to the State of Vermont, at his mother’s suggestion. The State dedicated the building as a historic shrine and opened it to the public the following year. Today, it appears almost exactly as it did on the night of the inauguration. 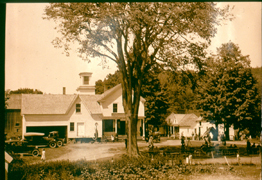 The historic district, which is at the center of the village of Plymouth Notch, contains a number of buildings associated with Coolidge and the 19th-century rural Vermont setting that he knew and loved. Visitors may tour the Cilley General Store, the Post Office, the Wilder Restaurant (serving lunch), the church, several barns displaying farming tools of the era, the dance hall that served as the summer white house office. In addition, visitors may tour the Plymouth Cheese Factory- established by the president's father-and sample the granular curd cheese produced there. The Calvin Coolidge Homestead District has been designated a National Historic Landmark. Click here for the National Historic Landmark registration file: text and photos. 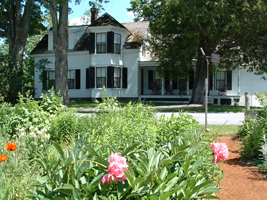 The State of Vermont administers the Homestead District as the President Calvin Coolidge State Historic Site. The historic site is open daily from late May until mid October, from 9:30am to 5:00pm. Visits should begin at the Visitor Center. An admission fee is charged. The Calvin Coolidge Visitor Center is located at 3780 Rte. 100A in Plymouth, VT. The Aldrich House, the site's office, is located at 249 Coolidge Memorial Rd. It is open weekdays year-round and has exhibits especially designed for winter visitors. For more information visit the President Calvin Coolidge State Historic Site website or call 802-672-3773. The Calvin Coolidge Memorial Foundation, located in the Union Christian Church in Plymouth Notch, has a website that provides additional information on Calvin Coolidge, his wife, and the homestead.